Today I’m sharing a few bar cart ideas to help you decide what to do with your outdoor bar cart. Don’t have one yet? Why not?! It’s a super versatile piece that will add so much to your yard. Read on to see 5 ideas for how to style your backyard bar cart. One of my favorite things we’ve ever added to our backyard is this outdoor bar cart. 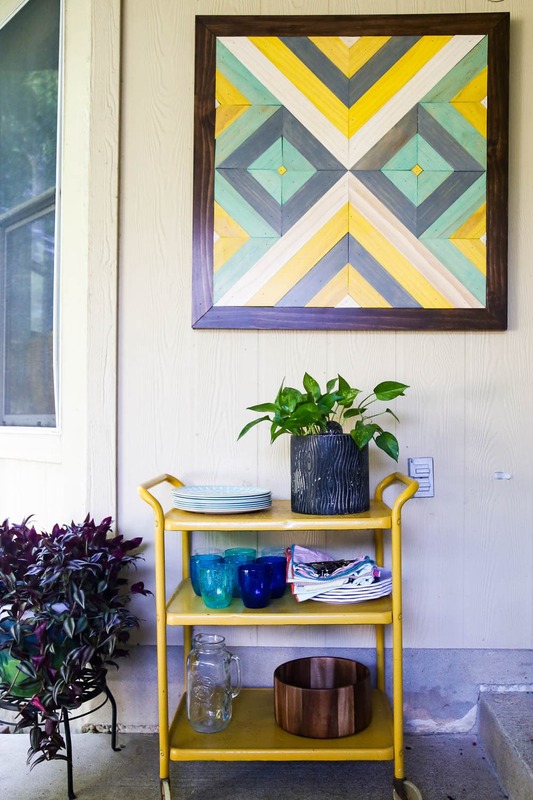 We found it at a local flea market and gave it a total makeover, and it’s been such a versatile and useful piece ever since. I change up how our bar cart is styled on a pretty regular basis – sometime’s it’s just a good place to store a few pretty outdoor things, sometimes it’s super functional and stores things we’re using on the regular, and sometimes it’s a mix of the two. 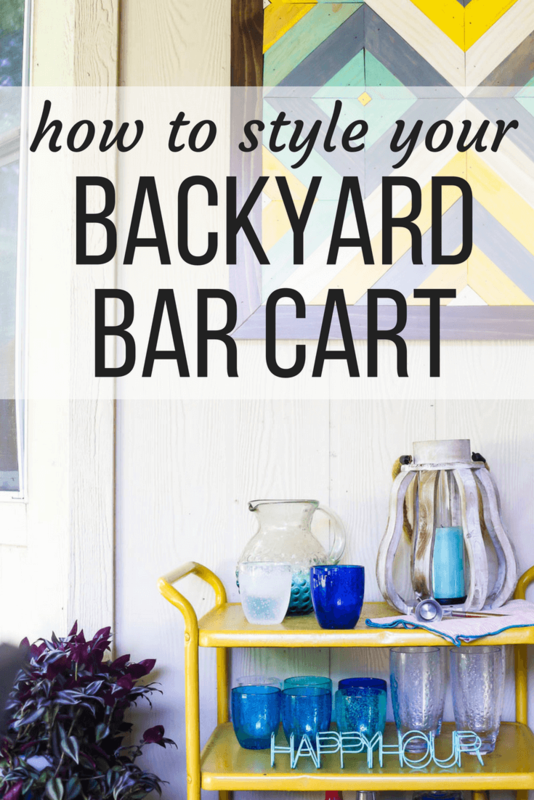 Basically, what I’m saying is, if you haven’t snagged yourself a bar cart for your backyard yet, you’re gonna want one after you read this post! I was thinking about how useful our bar cart is and I thought it might be fun to share a few different ways I like to use ours. So, I played around with styling it in a bunch of different ways, snapped a few photos, and I’m here to give you some bar cart ideas for how to style your outdoor bar cart 5 different ways. Use it as a potting bench. If you’re struggling to find a place to store extra pots, garden tools, or seeds you haven’t gotten around to planting quite yet, use your bar cart as a miniature potting bench! 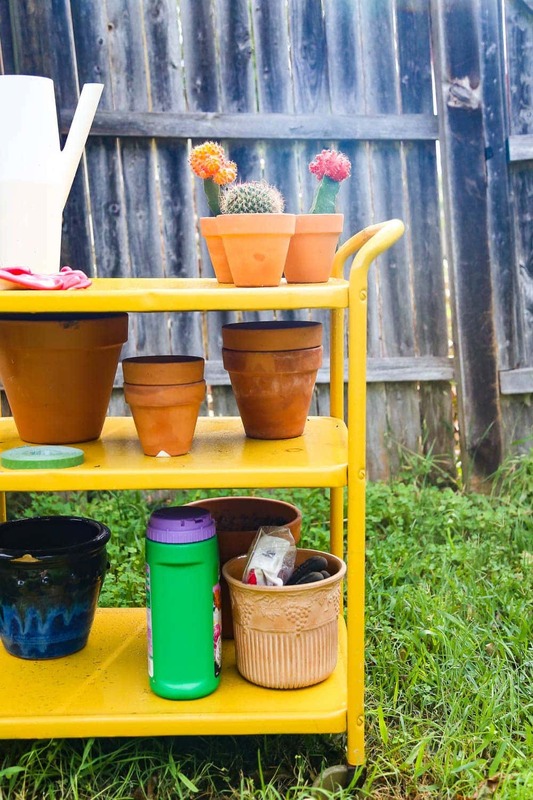 It won’t provide quite as much workspace as a regular potting bench would, but it’s the perfect solution if you’re short on space and will help clear up some of the clutter in your backyard. I left the top mostly open to allow for some room to work, but when you’re not working you could fill it up with a couple of pretty potted plants that you haven’t found a spot for yet – it keeps it looking nice, and it’s easy to just move them when you need to work. Use it as a grilling workstation. When we grill in the backyard, it can be difficult to juggle all of the tools you need, plus your seasonings, and the serving dishes you need once all the food is done. Corey often finds himself running in and out of the house multiple times throughout the process, and I’m sure it gets really old really fast. 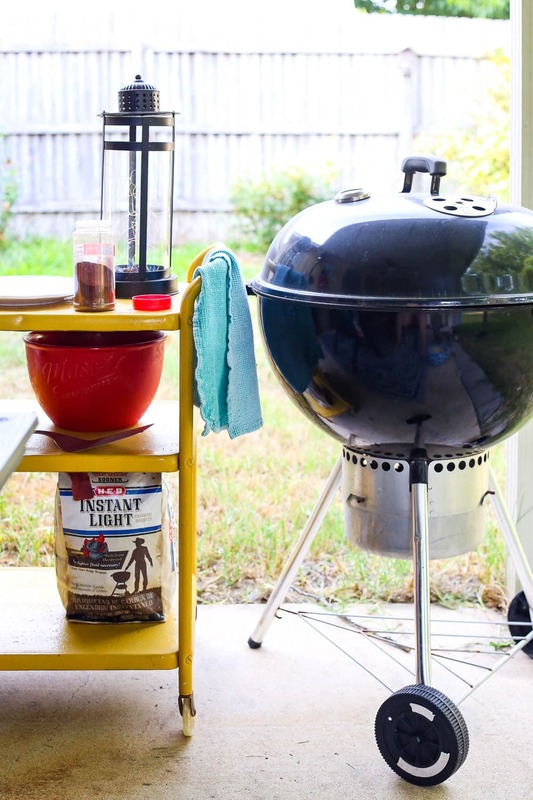 If you’re a frequent griller, consider setting up your bar cart to be used as a grilling station. Include your grilling tools, a few frequently-used serving dishes, your favorite spices, and a towel or two for cleaning your hands. If you use a charcoal grill, you can also stash a cute box (be sure it has a lid!) at the bottom for storing extra charcoal! Use it to store your patio dishes. This works best if you have a covered patio or something that will help prevent your dishes from getting super dirty when they’re not in use. I find that even with a covered patio, I generally have to give the dishes a quick rinse before we use them, but it’s worth it to not have to find extra storage space in our tiny kitchen. This is probably what we use our bar cart for most often – it’s the perfect place to stash outdoor cups, plates, and other serving dishes, and they always look super cute out there as well. Use it for kid’s toys. 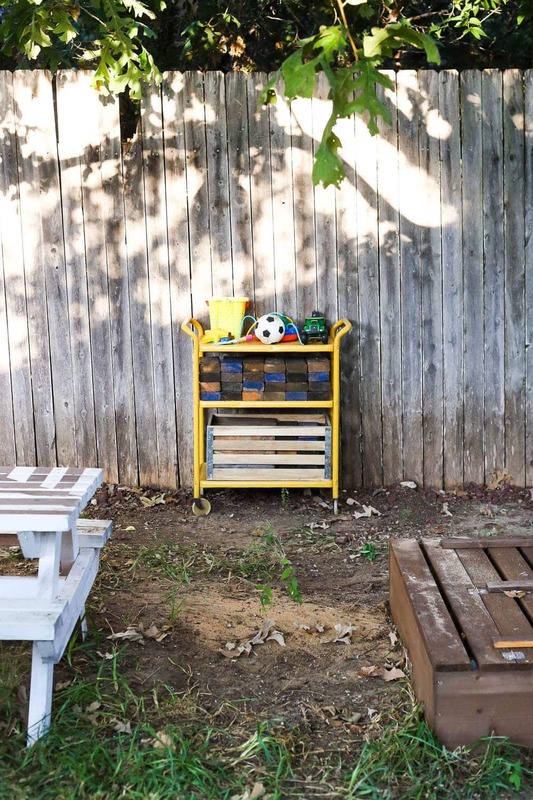 If you’re looking for a way to keep your kids toys from being all over the yard at all times (and really, don’t we all struggle with that?! ), you can always use your bar cart to help corral the kid clutter. I filled up the bottom shelf with a big basket that can be easily removed for sandbox play (although, as you can see, it’s filled with extra blocks right now) and used the top tiers for our backyard Jenga blocks and other things that he tends to use often in the backyard. It isn’t the cutest way to utilize your bar cart, but let’s be real – sometimes the function is just a little more important! Use it to serve drinks. Obviously, the most common way to use your backyard bar cart is to hold and serve your drinks when you are entertaining. This is great for when you have guests over, but on a day-to-day basis, it might leave the bar cart feeling a bit, well, under-utilized. I love to mix up a fun drink when we have guests, and I’ve been eyeing this adorable drink dispenser from Target – the bar cart is a really adorable way to make an ordinary night with friends feel a bit more special. Don’t forget to have straws, napkins, and plenty of cups available for your guests! 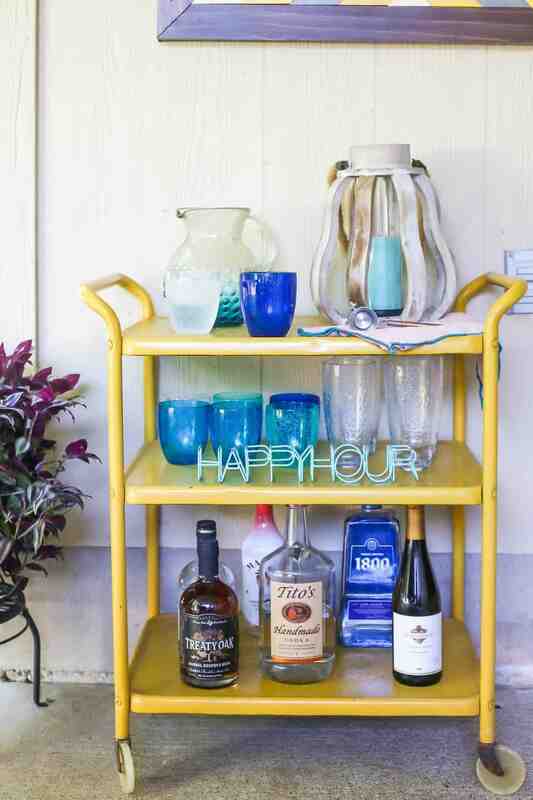 How else would you style your backyard bar cart? Any other genius ideas to share?! Previous Post: « Nursery Debate: Is a Nursery Mobile Really Necessary?